Every black hole conceals a secret — the quantum remains of the star from which it formed, say a group of scientists, who also predict that these stars can later emerge once the black hole evaporates. The researchers call these objects "Planck stars" and believe that they could solve a very important question in modern physics: the information paradox, or the question of what happens to information contained in matter that falls into a black hole. Most scientists believe that, since there is nothing to stop this collapse, eventually a singularity will form — a region where infinite densities are reached and Einstein’s general relativity ceases to be predictive. But this "singularity theory" has flaws. Since the laws of physics no longer apply in a region of infinite density, no one knows what could possibly happen inside a black hole. Stephen Hawking suggested in the early 1970s that black holes can slowly evaporate and disappear. But in this case, what happens to the information that describes an object that falls into a black hole? According to general relativity, information cannot simply disappear; inside a black hole, however, information apparently does. This "information paradox" has puzzled researchers for decades. Carlo Rovelli at the University of Marseille in France and Francesca Vidotto at Radboud University in the Netherlands have attempted to answer this question by exploring the idea that the universe, which is assumed to have started with the Big Bang, actually emerged — because of quantum gravitational effects — from a "big bounce," following an earlier contracting phase. "The quantum gravitational effects produce an effective repulsive force, so that matter wouldn’t have collapsed into a singularity, but it would have just reached a maximal compact state," Vidotto said. A similar idea has now been proposed for the fate of the collapsing matter of a dying star.Researchers say that quantum effects — similar to those that prevent an electron falling into the nucleus of an atom — would stop the collapse of a star before it could shrink to a single point, or singularity. The star would then become a super-compact object, bounce back during the evaporation process of the black hole and finally explode. Eventually, everything that would have fallen into the black hole would be released. The researchers say that, as the black hole evaporates and shrinks, its boundary will at some point meet that of the Planck star as it expands after the bounce. When that happens, there is no black hole horizon any more, and all information trapped inside the black hole can escape. In this case, the information paradox would be solved; the information would simply be re-emitted into the universe. "The black hole has a huge remnant — a Planck star — and this allows us to understand the evaporation of black holes, their final stage of life, without paradoxes. Paradoxes are not part of nature; they are the sign of some incomplete knowledge," Vidotto said. Rovelli agrees: "Information is never too concentrated, and it can escape with the explosion of the star." This release of information, he estimates, would generate radiation with a wavelength of about 10^-14 cm — the wavelength of gamma rays. 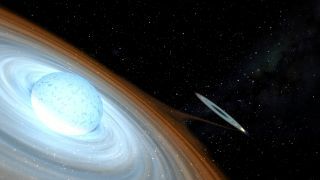 "Now we glimpse a tantalizing possibility: If, in the black holes, matter collapses and then bounces, the expansion can be a very dramatic event, a big explosion," Vidotto said. And possibly, the scientists add, astronomers have already observed Planck stars releasing the information into space, in the form of extremely bright events called gamma-ray bursts. Finally, if the theory is confirmed, it could be a solid proof that quantum gravity exists, said Aurelien Barrau of the Joseph Fourier University in Grenoble, France, who was not involved in the study. "The paper shows that there might be experimental consequences of quantum gravity," he said. "This would be fascinating." The next step would be to get a more accurate description of the quantum gravitational process that should lead to the "big bounce," possibly with the help of an accurate computer simulation of a realistic collapse, said Stefano Liberati, a physicist at SISSA (International School for Advanced Studies, Trieste, Italy), who did not take part in the research either. "If the idea [is confirmed] with more detailed calculations, it will be further evidence that what we call singularities in general relativity are just situations where our current theory lack predictability, but are resolved successfully by quantum gravity," he told Space.com via email. "At that point, the Big Bang or the center of black holes would not be 'the end of physics' but just another door to be disclosed, leading us to a quantum leap in understanding the nature of our universe." Follow Katia Moskvitch on Twitter @SciTech_Cat and follow us @Spacedotcom. We're also on Facebook and Google+. Original article on Space.com.